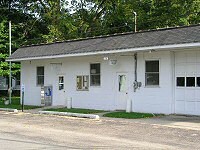 The Sherwood Branch Library is located in the Sherwood Township Hall building on Sherman street in Sherwood. Prior to the opening of this branch in 1960, the residents of Sherwood were served by a bookmobile service starting in 1947. Although one of the smaller branches, the Sherwood library has much to offer. Books, magazines, movies, and Internet-connected computers are all available for patron use. Sherwood branch also offers many programs for children and adults throughout the year.